This blog is supposed to mostly be devoted to the stuff I buy at estate sales (and thrift stores and flea markets and occasionally on the internets) but as I sift through my possessions and ponder their origins, I'm realizing that's a little limiting. Or at least, that one theme keeps recurring—one that speaks with a lilting accent and has a taste for vodka, herring and good design: Finland. See, my mother hails from the land of Marimekko and Moomins, and according to a keychain she once bought me at ScanFest (the Scandinavian festival that used to blow through our corner of Jersey once a year), this makes me 51% Finnish. I'm also a barrel of laffs because I've got a mug that proclaims it so ("Finns are Fun"). And, naturally, I've got Sisu—which is like the Finnish je ne sais qua but not quite so perky—because I had one of those license plate frames trumpeting the fact. True story: I was once idling at red light here in San Antonio when suddenly the driver of the car behind me appeared at my window. I nearly had a heart attack—was my car on fire?? No, she'd seen my Sisu license plate and couldn't quell the urge to express Sisu solidarity. (At great personal risk, I might add; this being Texas, I probably had the right to shoot her.) But there you go: Sisu—which translates roughly as a powerful will, determination, stoicism in the face of adversity—encapsulated in one anecdote. So along with Sisu, I've got a lot of Finnish stuff. Stuff that my mother brought over on the ocean liner back in 1961 and that she's slowly been relinquishing. Stuff my relatives have sent me for Christmas over the past many decades (always in the best wrapping paper bound with ribbon—never tape. Finns don't use tape, which may be a Sisu thing, not sure). Stuff I got—just a few things really, but naturally I still have them—when I went to Finland as a kid. See below, that's the puzzle that came in a bag of toys Finnair bestowed on all kid passengers back in the ’70s. Stuff I got when I returned to the motherland in my 20s. 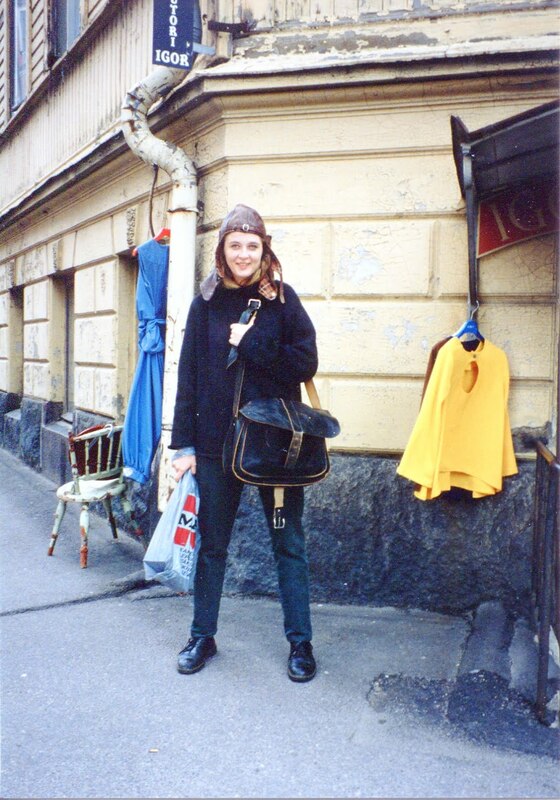 See above, that's me, age 25 and aglow with acquisitiveness, outside a Helsinki antique shop where I scored the WWII German pilot hat I'm wearing. The perfectly distressed leather schoolbag came from an animal-shelter thrift shop the day prior. And inside the plastic bag is a wooden elk I held on my lap the whole flight home. See the elk in question below—did you doubt that I still had it? You couldn't have—not if you've made it this far. The first time I went to Finland I was 7—and it was a pretty seminal experience. Maybe it's something about being 7, when you're first consumed by that fever pitch of curiosity about the world, and some stuff actually starts making sense. Maybe it's because we didn't travel much as a family; we spent almost all vacations on the Jersey shore so Christmas in the Arctic—well, that one really stood out. Maybe it's because Finland truly is a singular place—Marimekko and Moomins? Come on! Maybe that's why I remember everything from that trip. It also probably helped that my parents gave me a travel journal in which I assiduously documented my observations for three whole weeks. (And yes, I still have that journal but don't ask me where it is just now.) These days, I feel that whenever I buy something for my house I'm consciously/subconsciously circling back to what I saw on that trip (minus all the snow). If someone were to say my home reminded them of ’70s Finland I'd totally be thrilled. Some stuff just gets under your skin and stays there. And so that's why I will be featuring all things Finnish on Fridays, until I run out of Finnish things. TGIF! That means I'll be expecting you and the girls to head out this year. I would imagine they are aged impressionably right, no? Oh dear, I thought the Moomintrolls were Swedish. Yes, the title Finn Family was a clue, but I missed it. My Mum would probably call me "a right eegit." That's what she called the tour guide in Trieste who mentioned "the great British writer, James Joyce." Great blog, I always enjoy it. Looks more like a moose.